How to setup the Inertial Sense EVB-2 as a rover. 1. Connect EVB-2 to computer using EVB USB port. 2. Press the configuration button until the configuration LED is either green, blue, or purple. This connects the EVB USB port directly to the µINS module. c. Click on the RTK Tab followed by the Rover Mode Tab. Select RTK - GPS1 from the drop down menu and click apply. 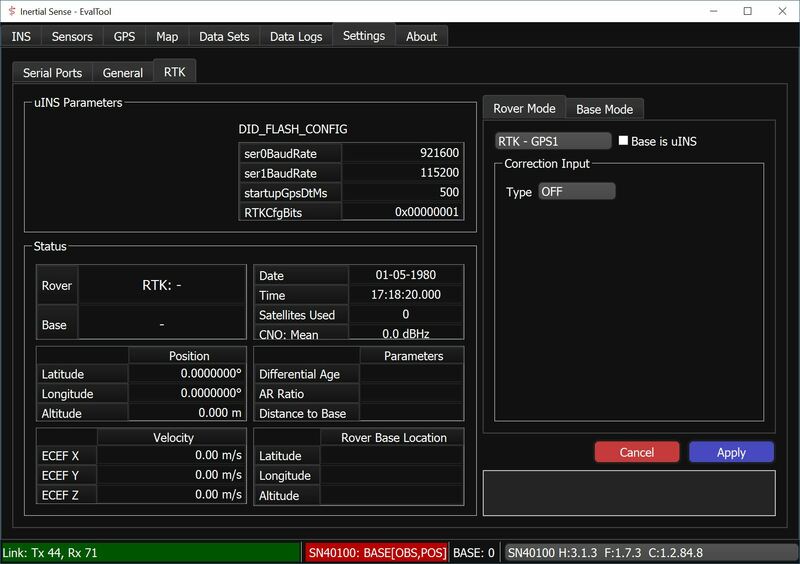 Use argument -flashConfig=RTKCfgBits=0x1 when starting CLTool to configure device as Rover. a. Press the configuration button until the configuration LED is blue. This will configure the XBee radio so that messages received by the XBee are forwarded to the µINS where they will be interpreted as base corrections. b. Use EvalTool or SDK to set DID_EVB_CONFIG.radioPID (integer 0-9) and DID_EVB_CONFIG.radioNID (hex 0 - 0x7FFF). These values need to match the values of the base station XBee radio. Any computer connected to this USB port can send base corrections data to the µINS over the virtual COM port which is created when this USB port is connected. The µINS will recognize the corrections packets and interpret them correctly. Press the configuration button until the configuration LED is either green, blue, or purple. This connects the EVB USB port directly to the µINS module. Any computer connected to this USB port can send base corrections data to the µINS over the virtual COM port which is created when this USB port is connected. The µINS will recognize the corrections packets and interpret them correctly. Press the configuration button until the configuration LED is green or blue. This connects the EVB-2 header 3 pins to the µINS module via RS232. Any RS232 compatible device can send base corrections data to the µINS using this connection. The µINS will recognize the corrections packets and interpret them correctly. Note - In this configuration the XBee radio is also active and communicates with the µINS serial1 port while the RS232 connection communicates with the µINS serial0. Press the configuration button until the configuration LED is purple. This connects the EVB-2 header 3 pins to the µINS module via RS422/485. Any RS422/485 compatible device can send base corrections data to the µINS using this connection. The µINS will recognize the corrections packets and interpret them correctly. Note - In this configuration the WiFi and BTLE modules are also active and communicate with the µINS serial1 port while the RS422/485 connection communicates with the µINS serial0. Wifi can be used to receive base corrections data. Bluetooth is not available at this time. a. The Wifi module must be configured to connect to a specific network. The device can save three networks onboard and will try to connect the configuration selected by DID_EVB_CONFIG.bits. Using the EvalTool DID_EVB_CONFIG.wifi[x].ssid (network name) and DID_EVB_CONFIG.wifi[x].psk (network passkey) must be set. b. 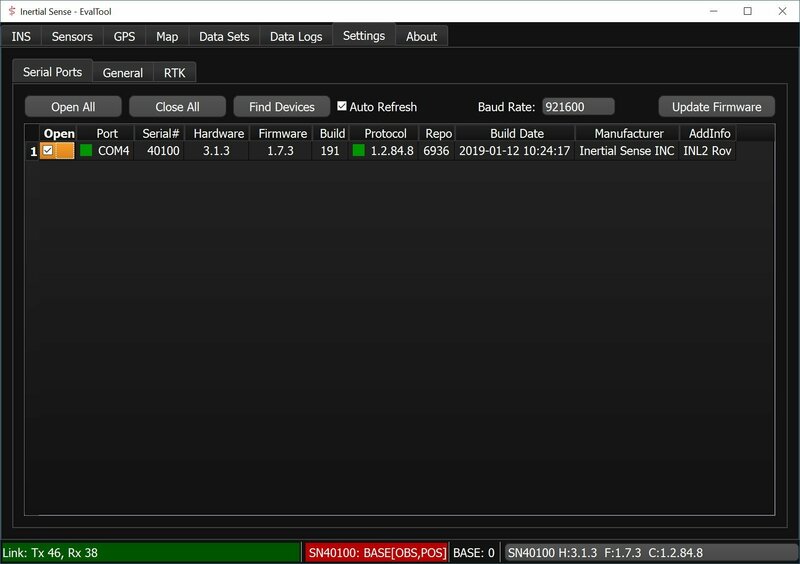 The IP address (hex) and port number (integer) of the device broadcasting must also be set in the EvalTool using DID_EVB_CONFIG.server[x].ipAddr and DID_EVB_CONFIG.server[x].port. Serial: Corrections are received by the EvalTool over the designated COM port. Baud Rate and Format must be set correctly. NTRIP: The EvalTool connects to an NTRIP server as designated by the Address:Port field. Enter Username, Password, Format, and Mount. TCP: Use TCP to connect to any other TCP server. Enter the Address and Port. The Format must then be selected.